Download "OFFICEHOLDERS PREPARATION OF INSOLVENCY RECEIPTS AND PAYMENTS ACCOUNTS REPUBLIC OF IRELAND. Contents. Introduction 1 4. Scope 5 6." 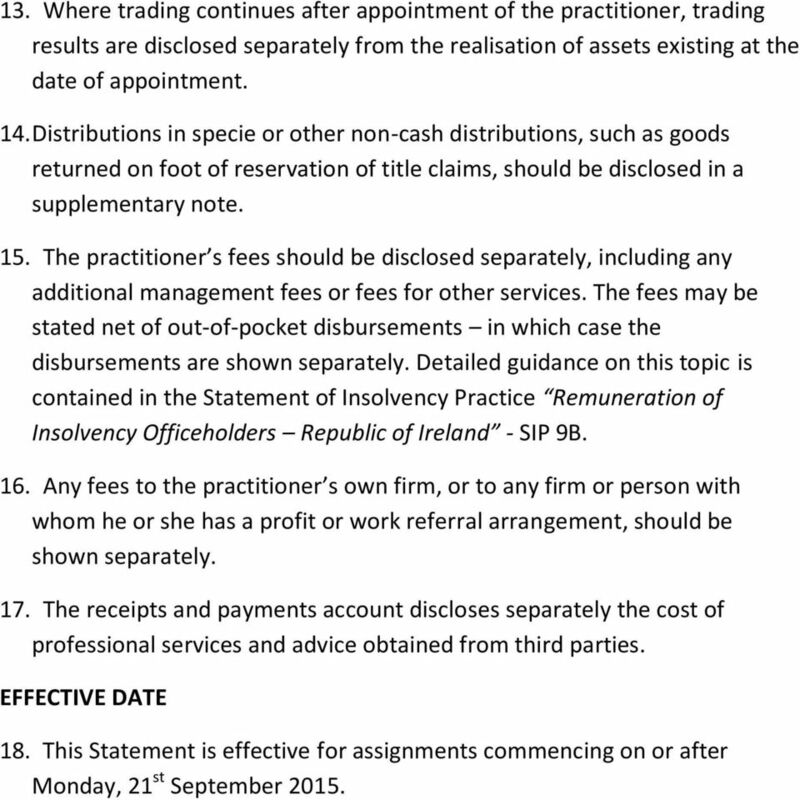 2 Officeholders preparation of insolvency receipts and payments accounts Republic of Ireland INTRODUCTION 1. 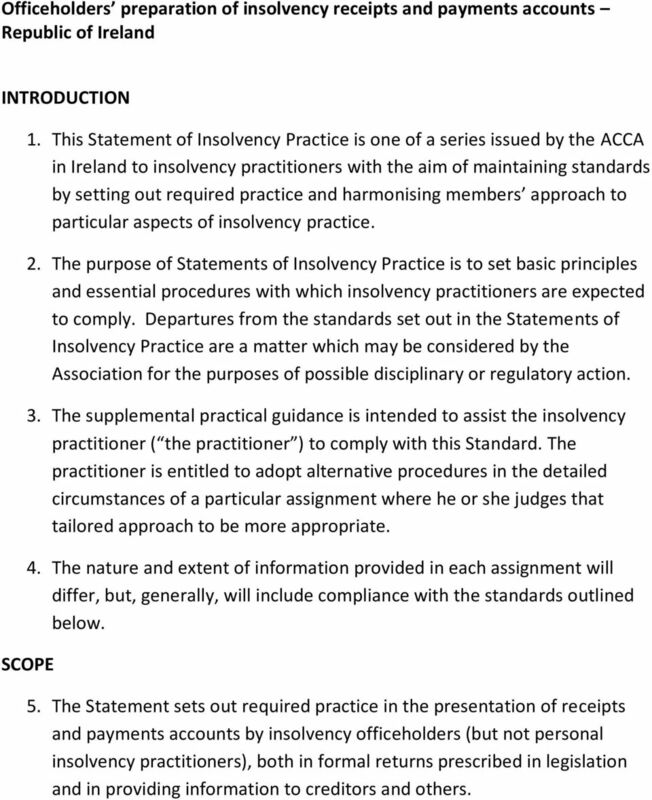 This Statement of Insolvency Practice is one of a series issued by the ACCA in Ireland to insolvency practitioners with the aim of maintaining standards by setting out required practice and harmonising members approach to particular aspects of insolvency practice. 2. The purpose of Statements of Insolvency Practice is to set basic principles and essential procedures with which insolvency practitioners are expected to comply. Departures from the standards set out in the Statements of Insolvency Practice are a matter which may be considered by the Association for the purposes of possible disciplinary or regulatory action. 3. The supplemental practical guidance is intended to assist the insolvency practitioner ( the practitioner ) to comply with this Standard. The practitioner is entitled to adopt alternative procedures in the detailed circumstances of a particular assignment where he or she judges that tailored approach to be more appropriate. 4. The nature and extent of information provided in each assignment will differ, but, generally, will include compliance with the standards outlined below. SCOPE 5. The Statement sets out required practice in the presentation of receipts and payments accounts by insolvency officeholders (but not personal insolvency practitioners), both in formal returns prescribed in legislation and in providing information to creditors and others. 3 6. The form and content of cash accounts required of Court appointed liquidators are outside the scope of this Statement, as are reports prepared by an examiner in accordance with Section 536, Companies Act PRINCIPLES 7. 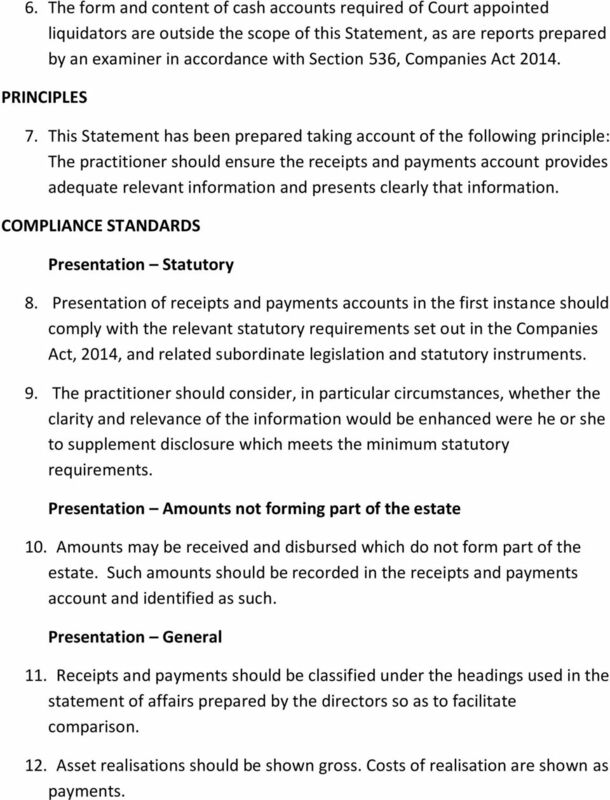 This Statement has been prepared taking account of the following principle: The practitioner should ensure the receipts and payments account provides adequate relevant information and presents clearly that information. COMPLIANCE STANDARDS Presentation Statutory 8. Presentation of receipts and payments accounts in the first instance should comply with the relevant statutory requirements set out in the Companies Act, 2014, and related subordinate legislation and statutory instruments. 9. The practitioner should consider, in particular circumstances, whether the clarity and relevance of the information would be enhanced were he or she to supplement disclosure which meets the minimum statutory requirements. 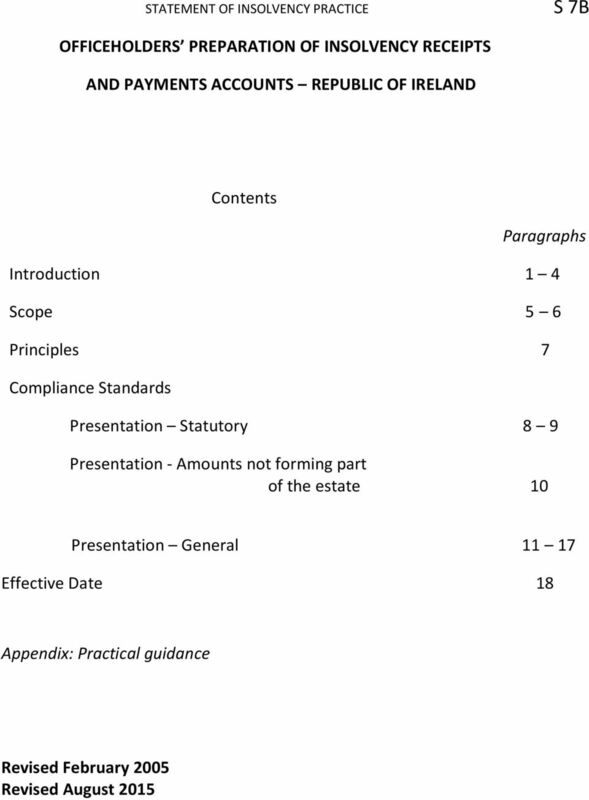 Presentation Amounts not forming part of the estate 10. Amounts may be received and disbursed which do not form part of the estate. Such amounts should be recorded in the receipts and payments account and identified as such. Presentation General 11. Receipts and payments should be classified under the headings used in the statement of affairs prepared by the directors so as to facilitate comparison. 12. Asset realisations should be shown gross. Costs of realisation are shown as payments. 4 13. Where trading continues after appointment of the practitioner, trading results are disclosed separately from the realisation of assets existing at the date of appointment. 14. Distributions in specie or other non-cash distributions, such as goods returned on foot of reservation of title claims, should be disclosed in a supplementary note. 15. The practitioner s fees should be disclosed separately, including any additional management fees or fees for other services. The fees may be stated net of out-of-pocket disbursements in which case the disbursements are shown separately. Detailed guidance on this topic is contained in the Statement of Insolvency Practice Remuneration of Insolvency Officeholders Republic of Ireland - SIP 9B. 16. Any fees to the practitioner s own firm, or to any firm or person with whom he or she has a profit or work referral arrangement, should be shown separately. 17. The receipts and payments account discloses separately the cost of professional services and advice obtained from third parties. EFFECTIVE DATE 18. This Statement is effective for assignments commencing on or after Monday, 21 st September 2015. 5 Appendix PRACTICAL GUIDANCE Presentation Amounts not forming part of the estate A.1 Amounts received from the Insolvency Fund for subsequent disbursement to the former employees do not form part of the funds of the estate and must be dealt with through a separate bank account. However, these amounts are included and separately identified in the receipts and payments account. A.2 Assets collected by the officeholder on behalf of a mortgagee are shown as receipts and any fee charged shown as a payment. 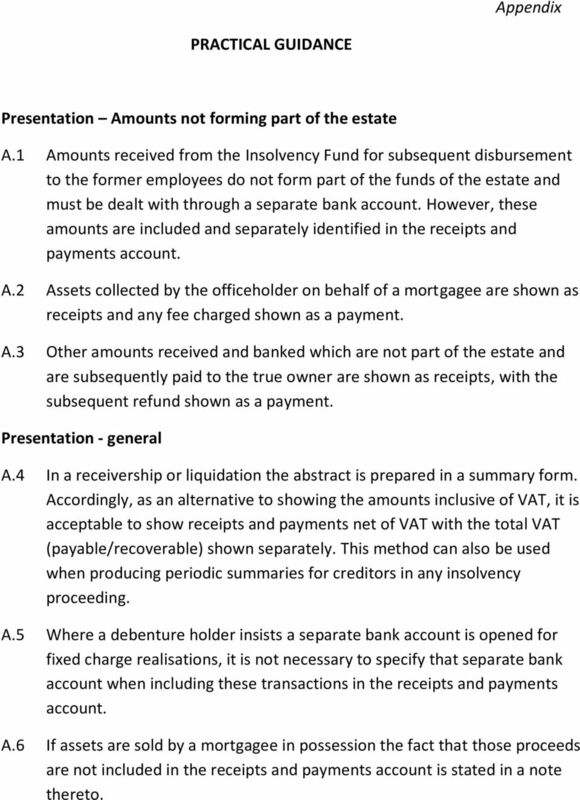 A.3 Other amounts received and banked which are not part of the estate and are subsequently paid to the true owner are shown as receipts, with the subsequent refund shown as a payment. Presentation - general A.4 In a receivership or liquidation the abstract is prepared in a summary form. Accordingly, as an alternative to showing the amounts inclusive of VAT, it is acceptable to show receipts and payments net of VAT with the total VAT (payable/recoverable) shown separately. This method can also be used when producing periodic summaries for creditors in any insolvency proceeding. A.5 Where a debenture holder insists a separate bank account is opened for fixed charge realisations, it is not necessary to specify that separate bank account when including these transactions in the receipts and payments account. A.6 If assets are sold by a mortgagee in possession the fact that those proceeds are not included in the receipts and payments account is stated in a note thereto. A CREDITORS GUIDE TO FEES CHARGED BY TRUSTEES IN BANKRUPTCY ENGLAND AND WALES 1 Introduction 1.1 When an individual becomes bankrupt the costs of the bankruptcy proceedings are paid out of his or her assets. A LIQUIDATOR S INVESTIGATION INTO THE AFFAIRS OF AN INSOLVENT COMPANY- ENGLAND AND WALES. 1. Introduction 2 2. Best Practice 3 3. 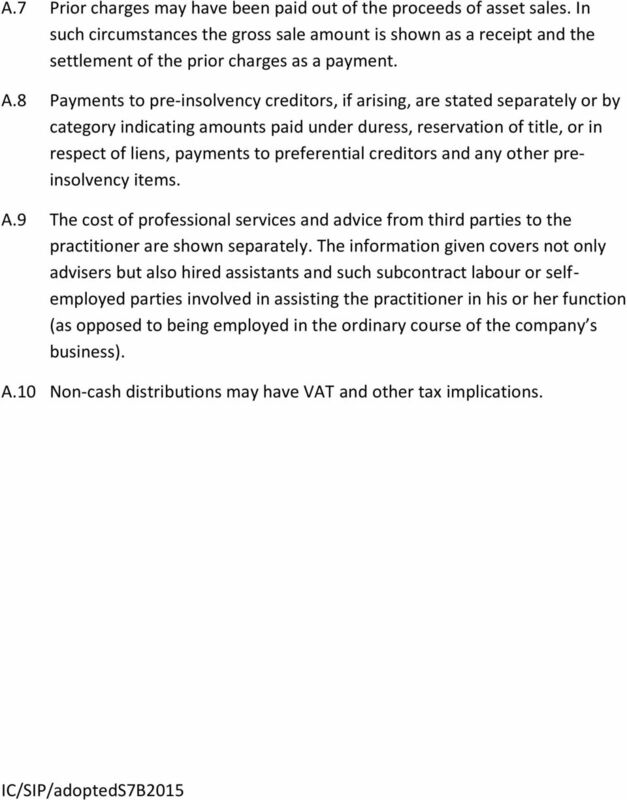 IGN G1 INSOLVENCY GUIDANCE NOTE Minimum Standards of Practice for Insolvency Practitioners November 2009 TABLE OF CONTENTS FOREWORD Paragraphs Introduction.. 1-3 Definitions.4 Practice Organisation.5 Ethics.